As most of you know, I recently had the good fortune to go on a “walkabout” with shepherds in the majestic Apennines in Abruzzo. This is the fourth in a series of photos that chronicle my experience. As I perused the multitude of images to choose one for this post, this one leaped out at me. I’ve spent quite a bit of time contemplating this special experience in Abruzzo, the area just above the heel of the boot of Italy. It was a dream opportunity for a photographer. And, it was a golden opportunity to escape the madding crowd of relentless digital and media onslaught to which we fall prey on a daily basis. I confess I’ve willingly allowed myself, all too often, to be sucked into this vortex of distraction, and angst. Yes, angst. I believe it would take a supremely enlightened being to deflect the anxiety-inducing effects of the age of information overload. If you’re like me, the world’s events can cloud your thinking, and you forget that vast spaces of quiet, peace and beauty still exist – literally and metaphorically. Life in Abruzzo, like many raw and unspoiled parts of Italy, can remind you that peace and spaciousness are always there. At least this is what my journeys there have done for me. Abruzzo is a jackpot in this regard. During my day on the mountain, I was reminded of the importance of balancing a busy, full-of-doing life, with a return to nature. I marvel at the life of the shepherds who allowed me to accompany them on their journey. I often think, this takes a special person – someone who is comfortable in their own skin, and someone whose “group” of friends is composed of vast numbers of sheep, goats, and dogs. Animals can teach us to come back to the present moment. I often envy them in this regard. I find being surrounded by animals curative. Unlike me, they’re not looking over their shoulders, being obsessed by the past and influenced by regret. They also aren’t playing out scenes in their head of what the future will entail and being anywhere but in the present moment. I ask myself this question almost daily. I’ve been living in Italy for three and a half years now, and my life has changed significantly. I came here with well-laid plans, and most of those have served me well. But, I quickly learned and was frequently reminded, that I benefitted from trusting that the path would open up before me and show me where to go. This is critical, I believe because transitioning to a life in Italy can be full of unpredictable twists and turns. If you’ve been following my blog for anything length of time, you’ll know this isn’t the first time I’ve written about this. Just when I think I’ve gained some traction in this regard, another whopper of a lesson comes along to teach me otherwise. Funny how life keeps serving up opportunities to build these muscles. I’m also learning not to beat myself up for not being so enlightened. Life these days is more and more about trusting that Life, God, the Universe – whatever force that connects us all – will take care of me, without my needing constant vigilance to control everything. I’ve spent a lifetime believing I have to be the captain of my own ship. That’s for the birds, and it’s exhausting. I’m anything but traditional in my beliefs, but one element from my Christian upbringing remains a regular mantra. That’s the 23rd Psalm. Often I replace the word “Lord” with “The Force”, “Life” and even “The River”. Regardless, I find peace and solace in believing that a benevolent universal force, the Shepherd, is guiding my path, and protecting me – if I’ll just let it. Funny how just one photo can evoke all sorts of feelings, isn’t it? I didn’t quite know, when I began this post, just why I had chosen this photo, but now it’s pretty clear. I pinch myself every day, being thankful I have a rich life in such an amazing country. But, regardless of where you live, beautiful expansive spaces abound. I encourage you to consider the restorative benefits of stepping away from the usual torrent of living and information overload. Sulmona is a great place to make your center of operations in Abruzzo. And, Novelia Giannantonio, who lives there with her delightful husband Peppe, knows everyone. She introduced me to Nunzio and orchestrated my day on the mountain. 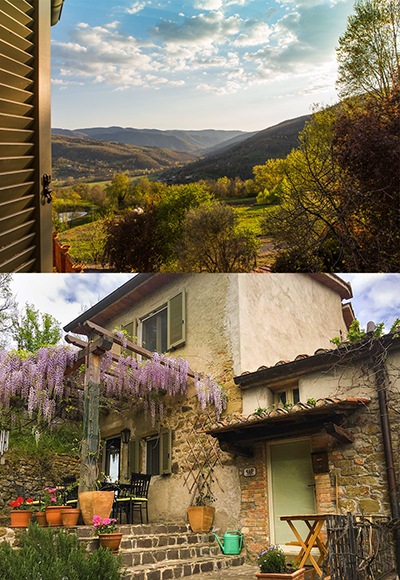 If you’re looking for a place to stay contact Novelia about her lovely spacious two-bedroom Casa di Cuore, which she rents out ( can put you in touch with her, just send me a note through my contact link). She and Peppe will make sure you’re pointed in the right direction about things to do. Another wonderful resource, which covers so many things about Sulmona (including other options for accommodations) is WelcomeToSulmona.com. It’s the best English language resource guide to Sulmona. I’d love for you to become a direct subscriber to Italywise.com. It’s easy. Just enter your email in the upper right column (or bottom of the page on a tablet). You’ll receive a confirmation email, and then future blog posts will land directly in your inbox! Beautiful post Jed, thank you. We leave late January so looking forward to some Abruzzo snow at Christmas? Lucky you! I’d love to be there to capture the snow. Please take and send photos. Ciao my dear friend and FRATELLO. I don’t need to had more than the rest of the comments that I have red in this amazing article, I have loved it because apart what you have written of your experience in walking with the sheperds (and it is incredible how a few hours of this amazing day has been so precious ) . I have loved your thoughts of the life in general, how things and situations change along the path of our life, but this happens only if we are ready to open ourselves unconditionally in making new experiences. You have had the chance to visit an almost unknown part of Italy and this has given you so much, at the same time we have recieved so much from you (and still are), YOU ARE A BEAUTIFUL SOUL. Novelia, Peppe. Jed, I traveled to Italy several years ago and your wonderful description of the fabulous countryside just makes me want to return!!! So glad you created Italywise to stay in touch. Love you, dear Jed. Thank you for continuing to spread your light! ? Love this picture and post. I agree, the animals can teach us many lessons. Grazie Nancy! We love our animal partners, don’t we? And, the so many more! Miss you and Luther. Great to hear from you Linda. I hope you’re keeping your sanity amidst all the craziness back in the States. I’ll be in Sulmona for Easter and the running of the Madonna, and I doubt I’ll be back in May. Let me know if you’re up in Veneto. Would love to connect! Jed, what a lovely meditation. I have shared it on my Facebook page. Thanks, my dear Kathryn! Miss you tons! Thank you, Jed……This is just what I needed to hear today! Thanks Penny. I always love hearing from you. Sending love and light to you as well! Great article as ever. In contemplating Sharyn and my life in Italy over the last four years part time (6 months each year) one way I think about things is to compare what we have been doing if we simply lived full time as retirees in our home country, Australia. There is no question our lives have been incredibly enriched by our Italian experience on so many levels (including walking with sheep and goats!). The wonderful friends we have made from many countries is the best aspect of all. We just feel incredibly fortunate. Thanks David. I, too, do a lot of comparison of what life would be like if I had chosen to stay in the U.S. I love seeing my family and friends when I go to the States, but the history, the colors, the textures, and the people here are wonderfully. Whenever I’m away, I’m homesick for my new country! When are you heading back?